Because of the wide choice of capacities and interfaces supported by NANDrive, it is compatible with many popular Arm-based processors and x86 chipsets. 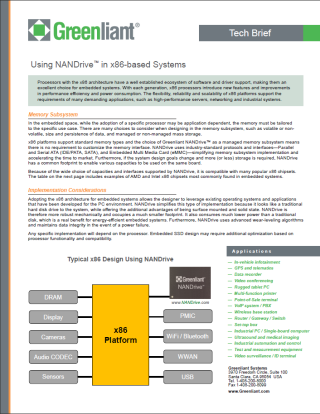 Our updated Tech Briefs illustrate this versatility with examples of Arm and x86 processors most commonly found in embedded systems. The Tech Briefs can be downloaded from our website and the links below, and used as a reference tool.